High Speed HDMI with Ethernet provides up to 10.2Gbps of audio/video bandwidth in addition to 100Mbps network data. It supports high-definition video plus multichannel audio in single cable. 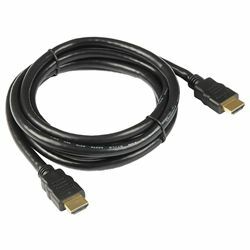 High Speed HDMI with Ethernet eliminates the cost, complexity and confusion of multiple cables for connecting audio/video systems, and can even eliminate the need for a patch cable too.